We have been recommending this book to customers and clients on a daily basis for years, so we decided to start carrying it here on our website! 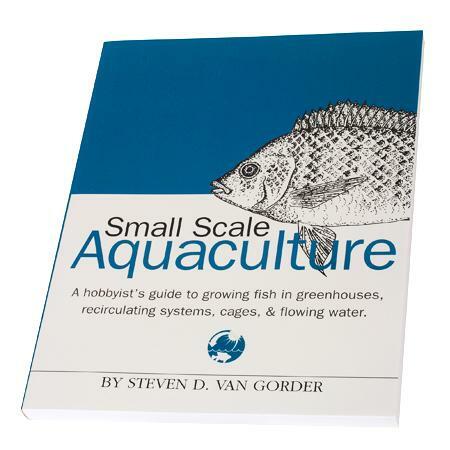 Steven Van Gorder's Small Scale Aquaculture is quite possibly the best book available for backyard fish farming enthusiasts, and with such a small price tag, it is an amazing value considering the incredible amount of info Steven has managed to pack into it. With Small-Scale Aquaculture as a guide, you can achieve a higher level of self reliance and provide a healthier diet for your family. Fish are one of the best sources of protein in the animal kingdom, low in calories and saturated fats, and this book describes exactly how you can grow fresh fish inexpensively throughout the year. Recirculating systems, greenhouse growing methods, fish cage grow out systems, flow through aquaculture, aquaponics systems and pond growing are all discussed in this fantastic book. Plans for building fish rearing equipment such as filtration systems, plumbing systems, aeration systems, fish cages and more are included, along with illustrations. Includes a wealth of fantastic information on tilapia, including grow out methods and breeding techniques.